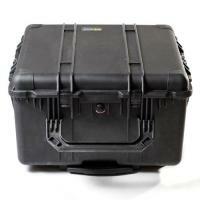 Pelican 1640 Transport Case 23.7" x 24" x 13.9" FREE SHIPPING! Home > Pelican > Equipment Bags > Police Equipment Bags > 1640 Transport Case 23.7" x 24" x 13.9"
Pelican 1640 Transport Case 23.7" x 24" x 13.9"
For durable transport cases, trust in the Pelican name. Known for their premium cases, the 1640 Transport case offers excellent portability and protection for valuable equipment. The crushproof, outer-shell stacks securely for bulk transit of cargo. Equipped with their standard O-ring seal, water and dust are kept away from contents. An automatic pressure equalization valve prevents vacuums from forming inside the case during flight, thwarting a vacuum lock situation. The interior features three layers of Pick N Pluck™ foam to cushion contents against potential damage from impact and vibrations. The corrugated lid foam offers added protection, shielding items from all sides. A retractable extension handle and four smooth-rolling polyurethane wheels make it easy to transport the 1640 over flat ground, while fold-down handles offer a firm grip for secure carrying. Interior Dimensions (L x W x D): 23.7" x 24" x 13.9"
Exterior Dimensions (L x W x D): 27.2" x 27.5" x 16.3"
©2002-2019 CopsPlus.com: Pelican 1640 Transport Case 23.7" x 24" x 13.9" FREE SHIPPING!